Small but not fragile, feisty but not yappy, pretty but not sculpted, Silkys are 10-inch-tall dynamos animated by curiosity and high spirits. The glorious blue-and-tan coat is straight and glossy, and it feels and behaves much like human hair. The wedge-shaped head is topped by profuse hair parted down the middle, and erect V-shaped ears draw attention to the keen, piercing expression of the almond-shaped eyes. Silkys are more refined than typical ratting terriers, but they should still look and behave like a true earthdog. A cross between the Yorkshire Terrier and the Australian Terrier in the 19th century resulted in today’s Silky Terrier. A tough little breed, they are as good at catching rodents and other vermin as they are a wonderful companion dog. Large, up to 9-10” at the shoulders, weighing anywhere from 8-11 pounds. The Silky Terrier is a short-legged, fine-boned little dog with a very long single coat. 5-6 inches in length, the Silky Terrier is born black but changes to blue with tan as the dog matures. The Silky Terrier has a life expectancy of 12-15 years and is prone to intervertebral disc disease, elbow dysplasia, patellar luxation, diabetes, epilepsy, tracheal collapse, and leg perthes. They may be little, but there is a lot of courage in that small sturdy package. 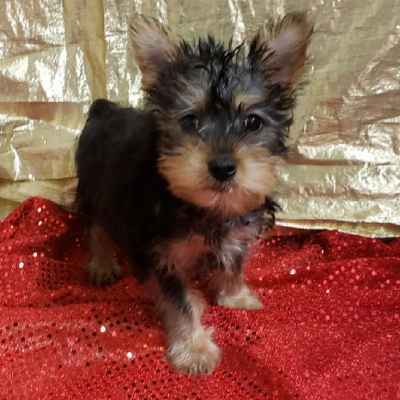 Your Silky Terrier is spirited, cheeky, busy, high-energy, curious, alert, affectionate, outgoing and highly intelligent. They enjoy learning and training will be easy if you use rewarding methods. This can be a willful breed, so they want to know what’s in it for them when you’re training. You need to be a calm, knowledgeable, and humane owner giving consistent and committed leadership to your Silky Terrier using only motivational training methods. The Silky Terrier is a busy and active breed, and requires a brisk daily walk and plenty of off-leash play and running in a safe, fenced area. They also need mental stimulation to prevent boredom and destruction, so be sure to provide your Silky Terrier with plenty of interactive toys that challenge their problem-solving skills. Grooming Requirements: Requires daily brushing and professional grooming to prevent matting Coat: Long Shedding: Little to no shedding Hypoallergenic: Yes Apartment Living: Good for apartment living if given sufficient exercise Lap Dog: Yes Good With Children: Better with older children who understand how to respect such a small dog Good With Other Pets: Good with other dogs when socialized at an early age; not trustworthy with small and non-canine pets. Size – Shoulder height from nine to ten inches. Deviation in either direction is undesirable. Proportion – The body is about one fifth longer than the dog's height at the withers. Substance – Lightly built with strong but rather fine bone. The head is strong, wedge-shaped, and moderately long. Expression piercingly keen, eyes small, dark, almond shaped with dark rims. Light eyes are a serious fault. Ears are small, V-shaped, set high and carried erect without any tendency to flare obliquely off the skull. Skull flat, and not too wide between the ears. The skull is slightly longer than the muzzle. Stop shallow. The nose is black. Teeth strong and well aligned, scissors bite. An undershot or overshot bite is a serious fault. The neck fits gracefully into sloping shoulders. It is medium long, fine, and to some degree crested. The topline is level. A topline showing a roach or dip is a serious fault. Chest medium wide and deep enough to extend down to the elbows. The body is moderately low set and about one fifth longer than the dog's height at the withers. The body is measured from the point of the shoulder (or forechest) to the rearmost projection of the upper thigh (or point of the buttocks). A body which is too short is a fault, as is a body which is too long. The tail is docked, set high and carried at twelve to two o'clock position. Well laid back shoulders, together with proper angulation at the upper arm, set the forelegs nicely under the body. Forelegs are strong, straight and rather fine-boned. Feet small, catlike, round, compact. Pads are thick and springy while nails are strong and dark colored. White or flesh-colored nails are a fault. The feet point straight ahead, with no turning in or out. Dewclaws, if any, are removed. Thighs well muscled and strong, but not so developed as to appear heavy. Well angulated stifles with low hocks which are parallel when viewed from behind. Feet as in front. Straight, single, glossy, silky in texture. On matured specimens the coat falls below and follows the body outline. It should not approach floor length. On the top of the head, the hair is so profuse as to form a topknot, but long hair on the face and ears is objectionable. The hair is parted on the head and down over the back to the root of the tail. The tail is well coated but devoid of plume. Legs should have short hair from the pastern and hock joints to the feet. The feet should not be obscured by the leg furnishings. Blue and tan. The blue may be silver blue, pigeon blue or slate blue, the tan deep and rich. The blue extends from the base of the skull to the tip of the tail, down the forelegs to the elbows, and half way down the outside of the thighs. On the tail the blue should be very dark. Tan appears on muzzle and cheeks, around the base of the ears, on the legs and feet and around the vent. The topknot should be silver or fawn which is lighter than the tan points. Should be free, light-footed, lively and straightforward. Hindquarters should have strong propelling power. Toeing in or out is to be faulted.